Today I have something very special for you. Purfylle's first guest crochet post brought to you by the fabulous Millie from 2crochethooks. Millie and Kristina are a mother and daughter crochet team that seem to have an endless supply of awesome crochet patterns that are eminently achievable to get you hooking right away. I can hardly believe that she has created this pattern just for our us over here at Purfylle. I hope you love a bit of unusual bling as much as I do! Lots of love and appreciation to Stella for letting us share a pattern with you today! Last year Stella shared her amazing Spool Knitting Tutorial with us at 2crochethooks and we agreed to create a special pattern just for her readers. Ummm.....well things happen and it took a bit longer for us to get it all together but now we are here and ready to share our Dragonfly Barefoot Sandal! Just in time for the Australian Summer! :) Yeah we totally planned that! Foot Jewelry aka barefoot sandals have been around for generations and were typically worn by brides at their wedding or for special occasions. The evidence suggest the fashion started in Asia and is now world wide. So, how about we create a little foot jewelry for you today? 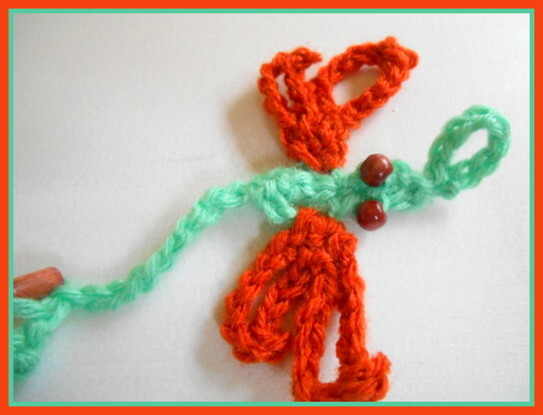 Check our blog @ 2Crochethooks to see the matching Dragonfly Slave Bracelet - another free crochet pattern! Let's get busy! This pattern was created to fit my size 9 foot - so if you have a smaller or larger foot you will need to adjust the pattern to fit. Easiest way - a smaller hook or reduce/increase the chains. With Body color, feed the three beads onto the yarn, long wood bead (lock) first, then eyes. Push down out of your way for now. yo 2 times around hook, insert hook into sc and draw through 1 loop, yo draw through 2 loops. yo twice insert into that same st and draw through 1 loop, yo and draw through 2 loops - you should have 3 loops on your hook, yo over 2 times insert into same st and draw 1 loop through, yarn over and draw through 2 loops, now you should have 4 loops on your hook. yo and draw through all 4 loops on hook. The wings are worked in the top half of the triple bobble stitch, right behind the eye beads. These instructions will have you working the short (back) wing first, then the long (front) wing. In Wing color, ss to first ch on dragonfly body from the back on the right side, sc in same stitch twice. Ch 1 and turn Ch 7, ss in 2nd ch from hook, ch 4, join into same sc (smaller wing made). ss to next sc, ch 9, ss in 2nd ch from hook, ch 6 and join in sc (larger wing made). Repeat on the left side, joining from the front of the dragonfly. Join to the body using a sc, ch 9, ss into 2nd from hook, ch 6, ss into sc, (big wing done) sc, ch 7, ss into 2nd from hook, ch 4, SS into sc (little wing done) ss to tail, sc around tail, SS 2 up other side, SC, ch 7, ss into 2nd from hook, ch 4, ss into sc, (little wing done) sc, ch 9, ss into 2nd from hook,, ch 6, ss into sc, ss into sc, (big wing done). break thread and weave in. F/o and weave in all ends. Test your fit then wear with a smile! Thanks for crocheting with us today! I hope you enjoy your new dragonfly barefoot sandal! 2 Crochethooks is a Mother and Daughter team working together to create and share simple crochet patterns and fun crafts. Let loose your inner crafter and join us today! always fun hangin and hookin w/you Stella!! Cute! Might even make a cute ring to bracelet combo!